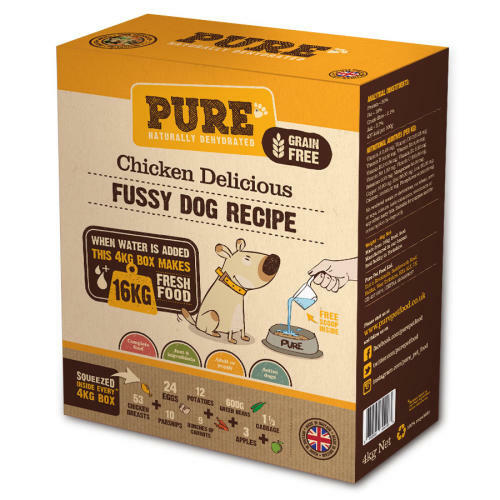 Treat your pooch with this Pure Chicken Delicious food which is a complete human quality food for dogs of all ages, breed and size. This food is both extra tasty and healthy for your pooch as the dehydration naturally preserves the food which removes the moisture but retains the nutrients and goodness found in the fresh and raw ingredients. Before the slow dehydration of all the ingredients, the meat within the feed has been lightly heated to remove any harmful pathogens, whilst the fresh fruit and vegetables are simply washed, prepared and cut to size. Ingredients/Composition: Chicken (40%), Carrot, Potato, Egg, Apple, Parsnip, Cabbage, Green Beans, Minerals. Nutritional Additives: Vitamin A 4,50mg, Vitamin D3 0,04mg, Vitamin E 60,00mg, Vitamin B2 80,00mg, Vitamin B12 0,08mg, Vitamin B1 5,00mg, Vitamin B6 9,00mg, Vitamin C 650,00mg, Selenium 0,10mg, Manganese 50,00mg, Copper 5,00mg, Zinc 80,00mg, Iron 60,00mg, Calcium 180,00mg, Phosphorous 120,00mg.